Northeast Health Wangaratta’s onsite café now meets the Healthy Choices guidelines thanks to the support from the CEO, the executive team, and determined staff. In 2015 Northeast Health Wangaratta (NHW) began implementing the Healthy Choices guidelines in its onsite café, with support from the Healthy Eating Advisory Service. The initiative was led by food services team leader, Jamie, and health promotion officer, Laura, with support from the board, CEO, and management team. 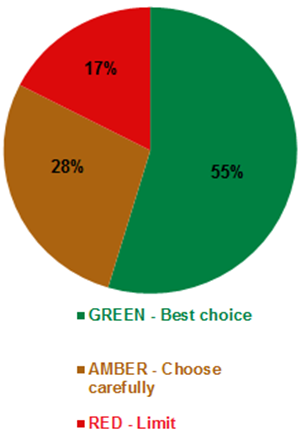 Within a year, the NHW café exceeded the recommendations of the Healthy Choices guidelines, with 55% of the foods and drinks on offer classified GREEN and only 17% are RED. NHW’s executive team saw the hospital-owned café as an essential opportunity to promote the health service’s commitment to improving the health and wellbeing of its 90,000 community members. CEO, Margaret Bennett, knows how important it is for a health service to set an example and also ensure they are promoting the healthier food choices that they so often recommend to patients. She encourages other CEOs to “practice what we preach”. Margaret believes implementing Healthy Choices at NHW will not only support healthy habits for staff and visitors, but also encourage conversations around improving the health and wellbeing of community members. "Our cafe is one of the areas our community members access, so it makes sense to ensure that what we offer promotes our commitment to improving the health and understanding of healthier food choices." The CEO, the board, and the executive team were all committed to implementing Healthy Choices from the very start. They committed to fully adopting and promoting the Healthy Choices guidelines in NHW’s 2015-2016 Statement of Priorities. This was then embedded within the organisation by implementing their own Healthy Food Choice Action Plan. Meeting the Healthy Choices guidelines was also included as a key performance indicator for Kim Bennetts, Director of Support Services. The Healthy Eating Advisory Service assessed the menu against the Healthy Choices guidelines, which showed that over 50% of the items were classified RED, and less than 20% were GREEN. The assessment report provided specific recommendations for improving the menu, so Jamie took on the task of reducing the amount of RED items and increasing the amount of GREEN, with support from Laura and HEAS. One of the first changes was removing many ‘impulse buy’ items, such as confectionary and chips, which significantly decreased the RED percentage. They also removed a drinks fridge, an ice cream fridge and the sandwich bar, and introduced ready-made sandwiches and a salad bar instead. There was limited ability to change the hot meal recipes as these are prepared in the same kitchen as those provided to patients. However, once the meals arrived in the café, the chef would add vegetables to improve their classification. Changes were communicated to staff and visitors through staff forums and leadership meetings. The new café menu was made available on their intranet so staff could see what was on offer that day, along with each items’ Healthy Choices classification to help guide their choice. Many of the items that were removed from sale were not huge sellers, whereas a lot of what they are offering now sell quite well. There was also very little feedback or resistance to the changes from customers, leading to a smooth transition to the improved menu. As a result, they haven’t noticed any effect on overall profits, despite massive reductions in RED options. What helped make this a success? Engaging with all relevant staff to include them in the change process. In particular kitchen staff and suppliers who are responsible for food provision. Continuously promoting and communicating the healthy eating messages to the staff and the community through all available forums. Dedicating a team to ‘champion’ the project to drive change and share the workload. This can also ensure the work will be sustainable, as several people are accountable for Healthy Choices continuing.